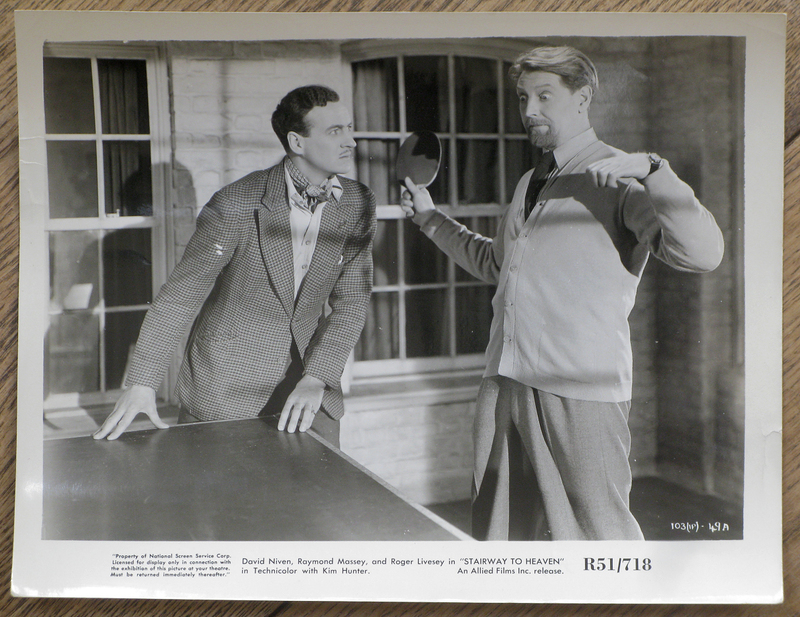 Here are two very different publicity stills from two very different films. Michael Powell & Emeric Pressburger’s A Matter of Life and Death (1946), which I watch often, and Robert Bresson’s Mouchette (1967), which I saw only once and will probably never see again. A Matter of Life and Death (in America it was titled Stairway to Heaven) is a very English fantasy film. David Niven plays Peter Carter, a Second World War pilot shot down over the English Channel. Leaping from his flaming aircraft he doesn’t die but washes up on a beach. He soon falls in love with the American radio operator (played by Kim Hunter) to whom he thought he’d given his last words. But he may have been affected psychologically by the brush with death: he begins to have hallucinations in which the world around him is temporarily suspended while a messenger appears from the afterlife to summon him. He should have died. In this suspension Peter argues with the messenger that he’s now in love and therefore cannot be summoned. His girlfriend and his doctor try to monitor these hallucinations. While Peter sleeps in the adjacent room they play table tennis. Suddenly they freeze. Peter wakes up. He knows the messenger is here. He rushes next door to tell the doctor but finds him immobile. Peter stares at him. Now strictly speaking, I guess this scenario shouldn’t ‘work’ as a still photo. How can you show an animate person looking at a frozen person when the photo freezes everything? But somehow it does work. The doctor’s body is so contorted, while Peter’s stare is that of a man poised with cogent intensity. It’s quite a grotesque photograph, like a punch-line for a missing joke. I watch the film often but I rarely look at this image. Nevertheless once seen, it is not forgotten. I don’t know of any other photograph that expresses this very unusual sense of time. I saw Bresson’s Mouchette several years ago and I’ve never been so moved by a film. I was shaking when I came out of the cinema. It’s about a young adolescent girl, the Mouchette of the title, whose poor life in a rural French village is hard. Her father is an alcoholic and her mother is very ill. She looks after her younger brother and does all the housework. She is teased and tormented at school, and ostracised in the village. Despite moments of joy there’s really nothing but pain and tragedy in her life. She seems strong enough to deal with her lot. One morning she is by a river. 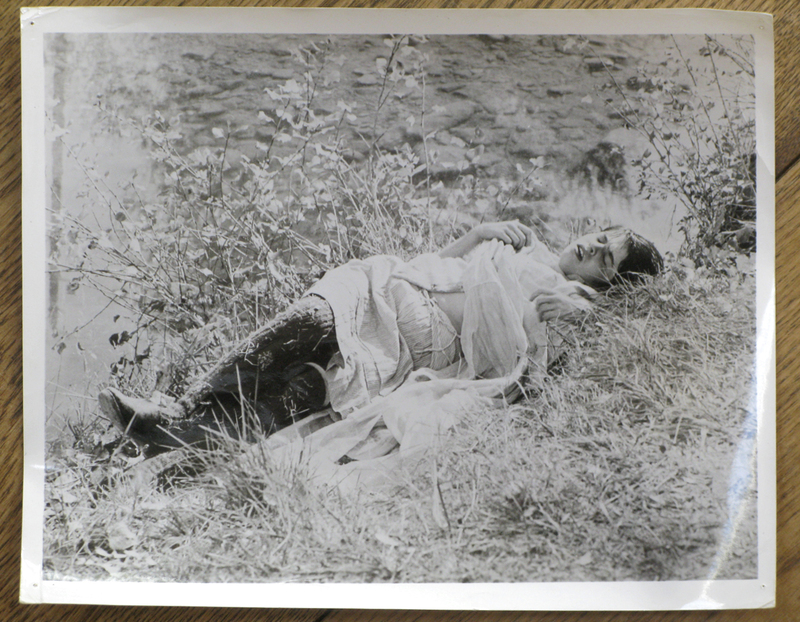 She rolls herself down the bank in her shawl and is stopped by a bush at the water’s edge. She seems to be doing it for the dizzying little pleasure. A stolen moment of abandon. But she does it again, this time rolling into the river to drown herself. It’s the last scene. Mouchette should be a ‘coming of age’ film but she doesn’t get that far. At a fleamarket in a French village last summer I found this photo and I treasure it, both as a beautiful picture and as a memento of a film I don’t think I can bring myself to watch again. I can think about Mouchette’s fate without having to put myself through it. Both of these photos were taken by stills photographers. Almost every film production has a stills photographer. Stills provide the movie with everything from working descriptions of interiors and locations to archival records. And of course they are made for publicity purposes. After the director has a take in the can the actors may be called upon to repeat their performance, ‘once more for stills’. What is performed firstly for the cinematographer is performed again for the photographer. Movements must be converted into stillness. The transfer is not always as straightforward as it might seem. Actors need to be posers too, but the essence of an unfolding scene may not be achievable in a single shot. The art of film acting is above all the art of movement, one might think. Stillness may deprive the actor of their métier. But the use of working models taken from life. Later he notes “Nine-tenths of our movements obey habit and automatism. It is anti-nature to subordinate them to will and thought.” The result is a style of performance in which both everything and nothing looks controlled. The ‘models’ perform with an inner calm and apparent stillness, even when moving. They ‘go through the motions’, we might say. Unfairly described as austere, the restraint in Bresson’s films can seem unapproachable but absorbing too. One task of the stills photographer is to condense and distil a filmic scenario into a readable image. Gestures are altered, body positions are re-organised, and facial expressions are held. Often the lighting is perfected, wayward hair and clothing are groomed so as not to distract and the camera focus is pin sharp. Caught between cinematic flow and photographic arrest, the classical film still has a unique pictorial character. Even today individual film frames are of low quality. The film grain is coarse and the image may suffer from motion blur or loss of focus. The richness and precision of the moving image we see on screen is in part an illusion, conjured by the real time projection. Flashing up, twenty-four frames per second, our visual pleasure derives from a constant tease. Always shifting, always changing, it is forever out of reach. It can never be trapped and held. The stills photographer can suggest movement but cannot recreate it. The static photograph made on set requires something else. It must satisfy the desire for fixity. The still photo must hold the stilled gaze. In the 1920s the silent movie was perfected. The 1930s then saw the introduction of sound. Styles of acting began to change. No longer did physical gestures need to carry everything. A line of spoken dialogue could be enough to energise a scene. The arrival of sound also changed the relation between cinema and the still image. Silent film had a secret affinity with the silence of photographs. Both were voiced by text – the inter-title, the caption. The ‘talkies’ interrupted that. Just as the arrival of cinema’s movement made photographs look still, the coming of sound emphasised their muteness. Thinking about it now, what I like about these two photos is that they come from moments in their films that are nearly silent. In this transition cinema became a truly popular form and a systematic industry. The finest technicians were under contract and the filmic image became a source of beauty, of desire, seduction and spectacle. Also, cinema became a popular art when mass media magazines were dominant. It was here that the film industry and the popular press began their co-dependence. Magazines carried publicity for the movies – advertisements, portraits, profiles, gossip, previews and reviews. They were also the home of photo-reportage. The crafted film still and reportage might at first strike us as total opposites. After all, cinema had already become an escapist world of fantasy while the subject of reportage was actuality, the real events of the world. But each in its own way had to solve the same two problems: visual clarity and narrative stillness. Film stills achieved it through staging and the use of large format cameras. Reportage took another route, a picture taking rather than making. It elevated quickness, lightness, mobility and economy of expression. The technical tools were minimal and immersion in the changing world was the key. Motion would be frozen in fleeting frames by solitary photographers working with the Leica camera. First introduced in 1925, it was small, neat and portable. It used the 35mm film that had become standard for the movie industry. Where cinema celebrated movement by recreating it, reportage celebrated by suspending it. Searching for beautiful and symbolic geometry, the photo-reporter would pounce when the world appeared to be organised momentarily as a picture: the ‘decisive moment’. And where the film still staged arrestedness, reportage used fast shutter speeds to freeze it. Both sought to trap fleeting detail and to halt time. And both pursued, as the artist-photographer Jeff Wall put it, ‘the blurred parts of pictures’. The image from A Matter of Life and Death corresponds with this classical idea of the film still, but Robert Bresson was after something else, something less polished and more direct. Stills from his films often have the look of seemingly casual photographs or reportage. Imperfect and spontaneous. Today the close analysis of films is open to anyone with a DVD player, or access to the internet. A movie can be watched as a whole or as a set of bits and pieces – scenes, chapters, freeze frames, alternative edits. To some extent we are all film theorists now. To watch is to analyse. Meanwhile the DVD has given a new life to the film still in the form of ‘picture galleries’ that are frequently included as extras. As a result our viewing habits and therefore the making of films has changed. Contemporary films expect to be seen in pieces. And it seems to be those filmmakers from the past whose work stands up to this repetition and fragmentation that are valued today. Alfred Hitchcock is the obvious example but one could also include Powell & Pressburger. I can watch any part of A Matter of Life and Death and enjoy it. In many respects the film is an elaborate string of set-pieces, perhaps less than the sum of its sublime parts. Mouchette is quite the opposite. In parts it is nothing. David Campany is a writer, curator and artist. His books include Art and Photography (Phaidon, 2003/2012); Photography and Cinema (Reaktion, 2008); Jeff Wall: Picture for Women (Afterall / MIT press, 2011) and Walker Evans: the Magazine Work (Steidl, forthcoming). He has published over 200 essays and writes for Frieze, Aperture, Source and Photoworks. In 2010 he co-curated Anonymes: unnamed America in Photography and Film, for Le Bal, Paris. His photographic work was shown recently at Kracow Photomonth.